The Best Juice blogs from thousands of top Juice blogs in our index using search and social metrics. Data will be refreshed once a week. Juice newsletter is a comprehensive summary of the day's most important blog posts and news articles from the best Juice websites on the web, and delivered to your email inbox each morning. To subscribe, simply provide us with your email address. About Blog All you need to know about juicing and your health - diet and nutritional information, juice recipes, juicer reviews, best buys and much more. Facebook fans 1,124,060. Twitter followers n/a. About Blog We help by creating and sharing delicious green smoothie recipes, plant-based meal plans to inspire and encourage you along the wellness journey. Facebook fans 326,511. Twitter followers 1,880. Collierville, TN, USA About Blog Juice Plus provides whole food based nutrition from 20 different fruits, vegetables, and grains, in capsule form. Facebook fans 586,862. Twitter followers 37,733. About Blog This community consists of folks interested in adding juicing to their lifestyles for general health and/or weight loss via juice fast (also called juice feast). Facebook fans 1,210,129. Twitter followers 576,609. New York, NY About Blog The online community for the film Fat Sick & Nearly Dead by Joe Cross. Find juice recipes, diet plans, and healthy inspiration to get you started today. Facebook fans 628,469. Twitter followers 31,134. Sonoma, California About Blog Williams-Sonoma Taste is a blog curated by the team at Williams-Sonoma, a brand devoted to cooking, and the special tradition of sharing a meal with friends and family. Facebook fans 892,395. Twitter followers 103,457. Derby, UK About Blog Stay up to date with the latest juice and juicing news in our exciting Juice Blog. Packed with recipes, ideas, testimonials and more! Facebook fans 9,252. Twitter followers 971. Peterborough, England About Blog Subscribe us to keep up with articles from Juicers UK. Facebook fans 546. Twitter followers 95. UK About Blog Jason Vale aka 'The Juice Master' has sold over 5 million books, made a movie and been on a mission to Juice The World for 20 years! Facebook fans 218,276. Twitter followers 58,048. Orange County, CA About Blog Our Mission at Juice It Up! is to consistently provide the freshest and most delicious juice offerings and healthy choices to our customers, and serve as advocates of healthy lifestyles. Facebook fans 158,187. Twitter followers 4,374. About Blog Follow us to keep up with articles from Daily Juice Cafe . USA About Blog Juicernet by Mulligan Associates is a full service provider of high quality commercial juicing equipment. Facebook fans 2,100. Twitter followers 456. Facebook fans 436,518. Twitter followers 24,243. New York, USA About Blog Living Juice is an organic, cold-pressed juice with NO added water or sugar. Made in New York, NY we believe in living life to the fullest - with 100% juice. Facebook fans 37,831. Twitter followers 1,469. Ventura, CA About Blog Healthy Living Through Juicing. I share all my favourite recipies, latest articles, and any other fun juicing stuff I find. Washington, D.C About Blog We make it easy and delicious to stay healthy. Founded by two ex-Wall-Street women, JRINK is a modern day juice bar delivering healthy solutions for the busiest of lifestyles. Facebook fans 2,916. Twitter followers 2,814. Fulham Road & Canary Wharf About Blog State of Mind explores everything about Organic Fresh Pressed Juices - From the ingredients inside our amazing juices, the lifestyle outside of our juices and exclusive interviews with key influencers in the Juice industry Take a minute and dive into our State of Mind. Facebook fans 651. Twitter followers 924. San Diego, CA About Blog Suja Juice regularly posts nutrition tips, healthy recipes, and wellness and food guides. We’re here to help you live a long and beautiful life! Suja Juice offers a variety of cold-pressed organic juices packed with fruits and vegetables. Facebook fans 439,854. Twitter followers 24,823. About Blog Fresh Vegetables and Fruits Juices are great sources of nutrition. Learn all about the great health benefits of raw juices. Dallas, TX About Blog Juicing can change your life! I know, because it changed mine. An auto accident left me with a brain trauma, overweight, insomnia, high blood pressure, poor night vision, and other health problems. After years of trying everything, I started juicing and just a few weeks later my health began improving dramatically. Facebook fans 52. Twitter followers 2. Woodbridge, Ontario About Blog Want to start a juice cleanse, but don’t know where to begin? At FresHouse we make the world of cleansing simple for you. Raw, Organic, Cold-pressed Juices. Facebook fans 1,165. Twitter followers 132. Austin, TX About Blog At Daily Greens™, we're driven to help people live their best lives. Shauna Martin, Daily Greens™' founder, discovered her passion for green juice and its benefits following her battle with breast cancer as a young mom. Facebook fans 147,830. Twitter followers 3,280. Facebook fans 236,776. Twitter followers 1,508. Toronto, Ontario About Blog For Those who are trying to truly eat a diet rich in raw foods this is for you. This is not about turning you into a raw vegan or vegan, its about giving you the tools you will need to build a cleaner version of you. Many need personal support on their journeys, and we are willing to offer our wisdom to those who wish to accept it. Facebook fans 11,002. Twitter followers 7,475. Facebook fans 566,261. Twitter followers 149,659. Kansas City, MO About Blog Ruby Jeans Juicery strives to create truly healthy beverages and snacks in an environment, which is welcoming and all-inclusive, to make healthy options available to all. Facebook fans 9,477. Twitter followers 722. Washington, DC About Blog Alexandra is a blogger creating plant-based recipes inspired by seasonal and local ingredients and making nourishing meals and holistic living accessible to all. Facebook fans 4,390. Twitter followers 1,454. Huntersville, NC About Blog Clean Juice is a fresh Juice and Smoothie bar offering a clean approach to on-the-go food. Follow us to see what we are about! Your body will love you for it. Facebook fans 11,058. Twitter followers n/a. Lexington, Ky About Blog The Press juice and health bar serves the Lexington and Central Kentucky area with natural and fresh cold press juice and cleanses. Facebook fans 4,221. Twitter followers 140. Malaysia, Kuala Lumpur About Blog At La Juiceria, we believe in a different approach in making the perfect juice. The cold-pressed way. It allows us to protect the nutrients and flavor of raw fruits and vegetables that we bring into our juicery. La Juiceria is the biggest cold pressed juice company in Malaysia. Facebook fans 19,136. Twitter followers 283. Facebook fans 4,908. Twitter followers 468. London, United Kingdom About Blog Cold Press Juicers are the UK exclusive distributor of Kuvings gold award winner, lelit coffee machines and gaggia. Keep up to date with latest articles on juices from this blog. San Francisco, CA About Blog Ugly Juice makes cold-pressed juice from oddly shaped produce that would normally end up as food waste. Every day we deliver it fresh to homes and offices. Facebook fans 1,071. Twitter followers 114. London About Blog Follow us to keep up with 100% pure fruit smoothies, orange juice, kids smoothies and tasty veg pots from Innocent. Facebook fans 597,369. Twitter followers 284,016. Baltimore, MD About Blog Baltimore based Gundalow Juice brings you delicious cold-pressed juices, with No shortcuts in processing, zero additives and never watered down. About - The one stop shop for all things juicing and health. About - Hello. We make healthy drinks and give 10% of our profits to charity. 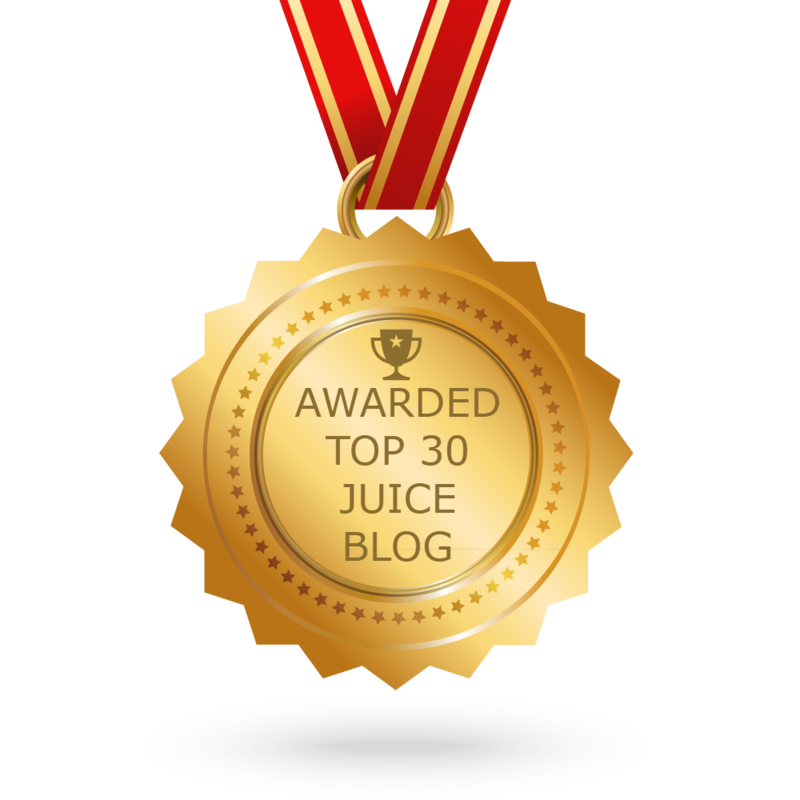 CONGRATULATIONS to every blogger that has made this Top Juice Blogs list! This is the most comprehensive list of best Juice blogs on the internet and I’m honoured to have you as part of this! I personally give you a high-five and want to thank you for your contribution to this world.